Adapted from Bon Appetit (I used pecans instead of walnuts – because pecans and dates? Yeah, they are just meant to go together) but otherwise kept the recipe pretty close. The nut idea threw me for a minute until I realized I often use a little nut butter (peanut or almond) in my smoothies. 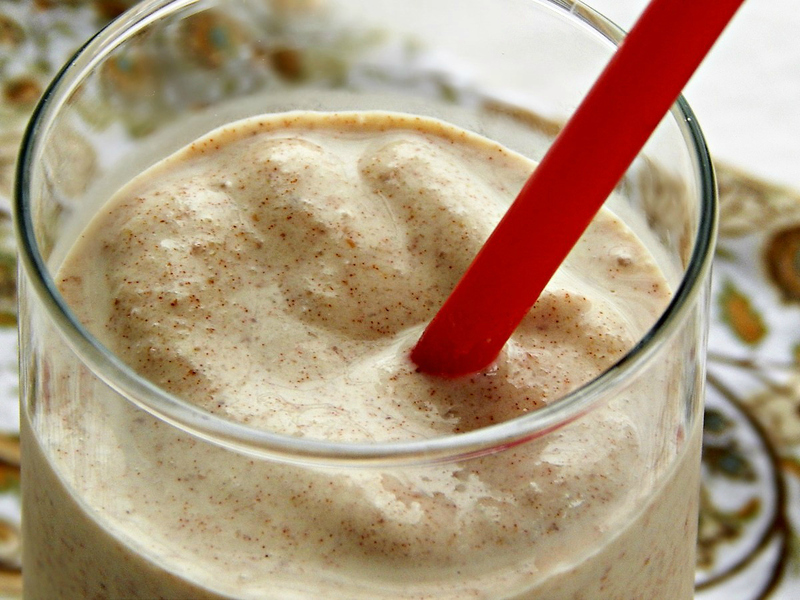 So why not pecans in a shake? I always stock up on items like dried fruit and nuts during the Winter Holiday Sales. There are often coupons, too. Freeze the nuts and make sure any dried fruit is in a heavy bag. Check Aldi, too, for great prices if you have one near you. Place dates in a small bowl and add ½ cup hot water to cover; soak 10 minutes to soften. Blend pecans, dates with their soaking liquid, cinnamon, and salt in a blender until a coarse paste forms. Add ice cream and ice and blend until smooth. If necessary, stop and stir and if needed add a touch more water. Note: to toast pecans, place in a 350 degree oven on a rimmed baking sheet and bake for about 8 to 10 minutes until dark and fragrant. Cool before proceeding with the recipe. Alternatively, place nuts in a skillet and heat over medium heat, shaking or stirring until nuts are toasted. I’ll be linking this recipe to our Throwback Thursday Link Party and to the Country Cook’s Potluck as well as Angie’s Fiesta Friday, cohosted this week by Judi @ cookingwithauntjuju and Cynthia @ eatmunchlove. This entry was posted in Click here for Fabulous Food Posts and tagged Dates, Dried Fruit, Easy Recipe, Ice cream, Nuts and Seeds, Pecans. Bookmark the permalink. Love dates too but never thought of them in a shake. So simple but looks so good. Will give it a try! I never eat dates but maybe I should learn to like/use them. Looks pretty tasty. Happy Fiesta Friday. Judi, these shakes are so good! Try them and I’ll bet you’ll be a convert! How interesting! I don’t use dates very often, but I might need to go get some for this! I actually went and got MORE dates so I can make them again – they are that good – then one of the folks got up in the middle of the night and ate the ice-cream. Empty carton and a spoon…so I’ll need to go back to the store, and hide the ice-cream, lol! Well heck, who knew a date shake could be so awesome??? p.s. great idea on the pecans! I Know, right??!! I want one for breakfast right now, lol. Might be a sin!! I made a smoothie sweetened with dates for the first time over the winter, and I was hooked!! I can imagine it is also good with ice cream, as a shake! I’ll have to try this! I’ve got to try yours, too – I imagine it’s a bit healthier. Is it on your blog? When I was little my Mom and Dad used to take us all to the date farm or ranch and we always left with a date shake. I have not seen this in a very long time they are absolutely delicious. How cool is that! I have never heard of a date shake before, but man are they good! I can almost taste it they are sooooo good!!! Usually I google a recipe before I post it and I didn’t until now…they are a thing lol! I wish I could see an orchard of dates! It’s pretty amazing. Row after row of date palms the one we went to had a hut with a roof of palm branches and they stood there with a blender just churning out shakes.